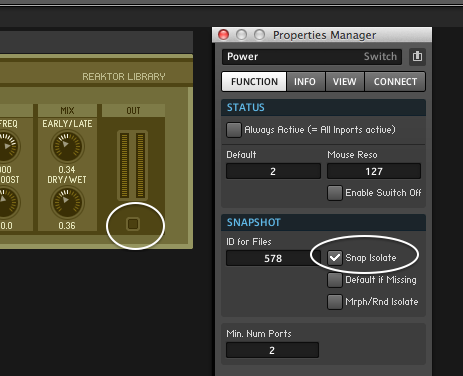 Quick tip: you can use the snap isolate option in the properties of Reaktor panel controls to keep a parameter from changing when you change snapshots. The above screenshot is from the “B” view of the Steam Pipe 2 front panel. I was getting sick of the godawful reverb slathered over every snapshot in the ensemble, so I turned off the reverb with its power control and set that control to snap isolate so it would stay off when I changed snapshots. This entry was posted in Learn, Practical Reaktor on January 25, 2015 by peterdines. Here’s a tutorial video from NI that was posted about a month ago and has a comically low number of views. 342 views? Ridiculous! This is a great introduction to the differences between instruments, ensembles and Reaktor Player instruments, which they refer to as Komplete instruments. This entry was posted in Ensemble and tagged instrument, reaktor, tutorial, Video on March 8, 2014 by peterdines.